Imagine the scalding rhetoric that would have boiled from the likes of Newt Gingrich, that Metternich of many green rooms, if Hillary Clinton had offhandedly undermined the collective security architecture of U.S. foreign policy since NATO was created in 1949. 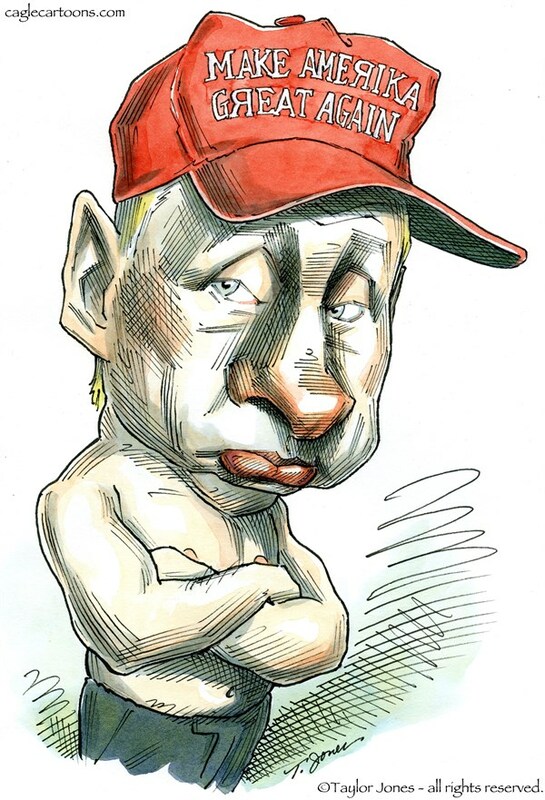 Vladimir Putin's regime is saturating Europe with anti-Americanism, buying print and broadcast media, pliable journalists and other opinion leaders, and funding fringe political parties, think tanks and cultural institutions. (Putin is again following Hitler's playbook; read Alan Furst's historical novel "Mission to Paris," set in prewar France.) Putin is etching with acid a picture of America as ignorant, narcissistic and, especially, unreliable. Trump validates every component of this indictment, even saying that the U.S. commitment to NATO's foundational principle  an attack on one member is an attack on all  is not categorical. Gingrich, who is among the supposed savants who will steer Trump toward adulthood, flippantly dismisses Estonia, a NATO member contiguous to Putin's Russia and enduring its pressure, as "some place which is in the suburbs of St. Petersburg." Gingrich thereby echoes Neville Chamberlain's description, three days before Munich, of Hitler's pressure on Czechoslovakia as "a quarrel in a faraway country between people of whom we know nothing." It would be fanciful to suggest that Trump read a book, but others should read Svetlana Alexievich's "Secondhand Time: The Last of the Soviets," an oral history of post-Soviet Russia, 1991 to 2012. A recurring theme is Russian nostalgia for the Soviet era: "We had a great empire  stretching from sea to sea, from beyond the Arctic to the subtropics. Where is it now? It was defeated without a bomb." Nostalgia coexists with Soviet-era memories like this: Twenty-seven people share an apartment with one kitchen and one bathroom, including a mother of a 5-year-old daughter and a childless woman. The mother is secretly informed against. Before being sent into the gulag for 17 years, she begged the childless woman to take care of her daughter, who comes to call the woman "Mama." After the real mother serves her sentence, under perestroika she sees her police file and recognizes her informant's signature  her childless friend. The mother went home and hanged herself. Putin's constituency of nostalgia, writes Alexievich, is in the grip of "the narcosis of old ideas" acquired when "the state had become their entire cosmos, blocking out everything else, even their own lives." She repeatedly records longings for the days before the eruption of ethnic hatreds to fill the void left by the melancholy, long withdrawing roar of socialist faith. During one ethnic pogrom, "the youngest girl climbed a tree to escape . . . so they shot at her like she was a little bird. It's hard to see at night, they couldn't get her for a long time. . . . Finally, she fell at their feet." "We shouldn't overstate Putin's efforts, which will hardly determine the outcome of the election. Still, we should think of the Trump campaign as the moral equivalent of Henry Wallace's communist-infiltrated campaign for president in 1948. . . . A foreign power that wishes ill upon the United States has attached itself to a major presidential campaign." It is unclear whether any political idea leavens the avarice of Trump and some of his accomplices regarding today's tormented and dangerous Russia. Speculation about the nature and scale of Trump's financial entanglements with Putin and his associates is justified by Trump's refusal to release his personal and business tax information. Obviously he is hiding something, and probably more than merely embarrassing evidence that he has vastly exaggerated his net worth and charitableness. In Wednesday's news conference, Trump said, "I have nothing to do with Russia." Donald Trump Jr. says, "Russians make up a pretty disproportionate cross-section of a lot of our assets. We see a lot of money pouring in from Russia."